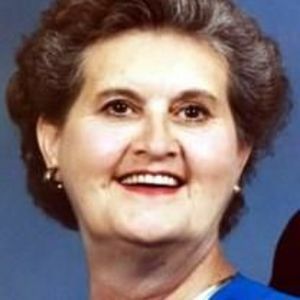 Martha Ann Lewis Cole, God's good and faithful servant, peacefully passed away on Tuesday, November 21, 2017 at Duke Raleigh Hospital. She was the wife of Samuel "Sam" Jennings Cole (deceased 2009) of 57 years. Ann is survived by her daughters Sharon (Shay) Cole Vaughn and husband Stuart Vaughn of Wilmington, NC; Nancy Vann Cole of Atlanta, GA; Tracy Cole Gable of Jacksonville, NC; and son, Samuel Jennings Cole, II and wife Pamela Knittel Cole of Raleigh, NC. In addition, she is survived by her three grandsons: Jeb Stuart Vaughn (wife Brenda), Foster Cole Vaughn, and Wyatt Walter Gable. Beloved nieces Alicia Lynn Cole, Alice Kay Looney and nephews Andrew Campbell Cole and James Roy Looney. Ann was born in Edgecombe County, NC, on March 23, 1930 to parents Van Buren Lewis and Alice Edith Harrell Lewis. She graduated from Red Oak High School and attended Louisburg Junior College where she played basketball and met Sam. She and Sam resided in Chapel Hill and Fremont, NC briefly and then moved to Cary where they met many lifelong friends. Later they resided in Raleigh at the Governor Morehead School for the Blind and Deaf where Sam was Superintendent. Ann worked at UNC-Chapel Hill general administration for over 20 years. Ann enjoyed worship and Sunday School classes at Forest Hills Baptist Church where she and Sam were members since 1968. She also enjoyed gardening, genealogy, and antiquing but her true passion and delight was spending time with family. A visitation will be held at Brown-Wynne Funeral Home, St Mary's Street from 10:00 - 11:00am on Saturday, November 24 immediately followed by a funeral service beginning at 11:00. Ann will be buried at Macclesfield Cemetery in Macclesfield, North Carolina. In lieu of flowers, the family requests donations to be made to the NC Library for the Blind whose books on tape brought many hours of enjoyment to her in her later years.